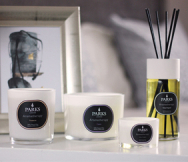 Parks’ Blue Camomile and White Tea Perfume Diffuser Set includes everything you need to scent the air of any home, office or other space in a pure, natural way. 100ml of our unique blue chamomile and white tea scent mixture is included, which will last between 6 and 8 weeks when used with the included natural reed diffuser sticks. Blue chamomile (often called German chamomile) is known to aromatherapists as a very soothing scent. It forms the base of many formulations that aim to ease worries or stress, enhance relaxation, or give troubled patients a gentle emotional peace. The scent of blue chamomile has been called herbal and green, but with a strong fruity component and a much richer, almost bitter undertone. Interestingly, blue chamomile is actually derived from white chamomile flowers. It is called ‘blue’ because of the presence of azulene in the final product when it is traditionally steam distilled. This substance has a very rich blue colour and is also considered to be a powerful antioxidant. White tea, on the other hand, is a piquant and relaxing scent that speaks to us of purity and alertness. When combined with the delicate floral top notes of chamomile, it works to revitalise and promote wakefulness without over stimulating. It also supports blue chamomile’s ability to support relaxation and reduce stress, so the two work incredibly well together. Together, this set is deeply revitalising and stimulating in the gentlest way possible. This is a complete gift set as well, and so comes in a lovely presentation box.